If I asked you where to buy Venetian carnival masks, would you know? You know the type of masks I'm talking about, beautiful masks once worn in Venice society by noblemen and servants - to keep their identities and activities hidden. When you think about it, I'm surprised more celebrities don't wear these. The paparazzi might still be able to take their pictures, but it would be hard to prove who's actually behind that mask. OK, just a thought. Maybe nobody still wears these masks while going about their daily business, but they are recognized for their beauty and craftsmanship and are collected for use and display by people who appreciate fine art the world over. 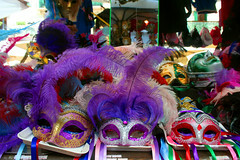 And they are still worn during the world famous Carnivale in Venice. Whatever style of Venetian Face Masks you're interested in - Bauta, Columbine, Medico Della Peste, or Moretta - you can find them all at 1001 Venetian Masks. Each mask is hand selected and made by Master Artisans and is 100% authentic – no imitations. 1001 Venetian Masks is a family owned business, providing a great selection of Venetian masks and exceptional customer service. Please be sure to check them out. These masks are gorgeous! I actually clicked your link. Cool! Would be wonderful for Halloween--expensive, but cool.